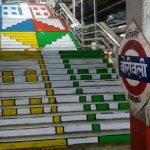 10 staircases colourful painted with distinct design. 8 pillars across all platforms colour coated (VIBGYOR theme). 20 panels artistically painted on 2 Foot-over-bridges and on the wall between the ticket window and the bridge on the west side. 2 ticket windows artistically designed with social messages.